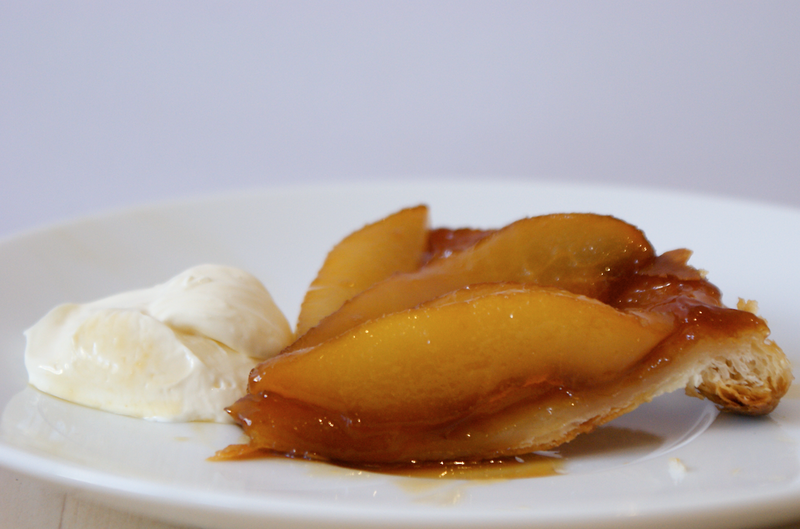 A month or so ago, over at the wonderful Yummy Supper, I saw Erin's recipe for Pear Tart Tatin. I bookmarked it and promised myself I would make it as soon as possible. I set about doing so a week later, but the flaky pastry recipe I tried out went quite wrong. Since then various things have conspired against me, but finally - finally! - I made it yesterday. 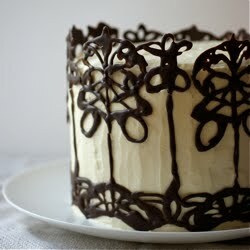 This impatience is partly because of making Pear and Caramel Cakes last summer. The combination is just heavenly - and it's not hard to guess how much I like pear-and-something-yummy duos. I've never really understood fancy salts. I remember seeing a massive selection on the wonderful food floor of a department store in Milan and being quite bemused as to why somebody would need or want that many types of salt. Then, recently, I started seeing fleur de sel popping up everywhere, usually linked with some divine caramel concoction. It still passed me by but must have lodged somewhere in my brain, for I recognised it while browsing the shelves at the supermarket. Yesterday I gave in and bought some. I still have absolutely no idea what my small local Co-op is doing selling gourmet salt, but there you go. 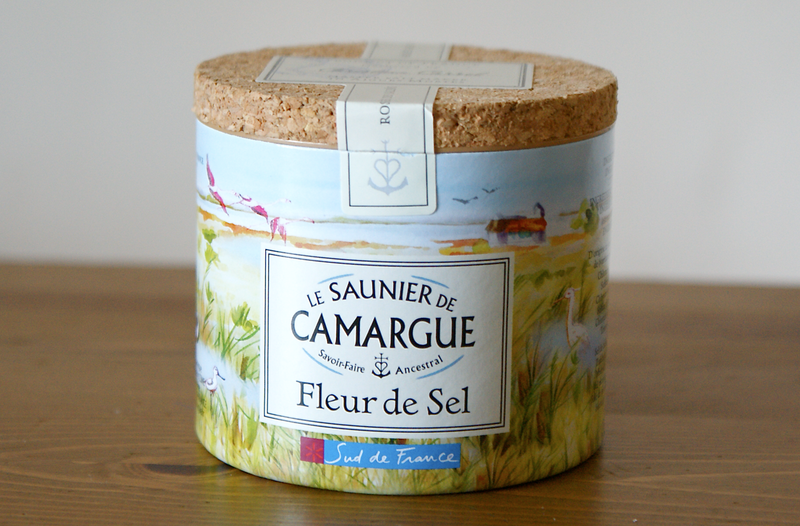 The box describes the salt as "precious petals of salt gathered by the sauniers hands... exalts the taste of your dishes". I love the idea of the petals, but most of all I like the idea of the dish being exalted by the salt. 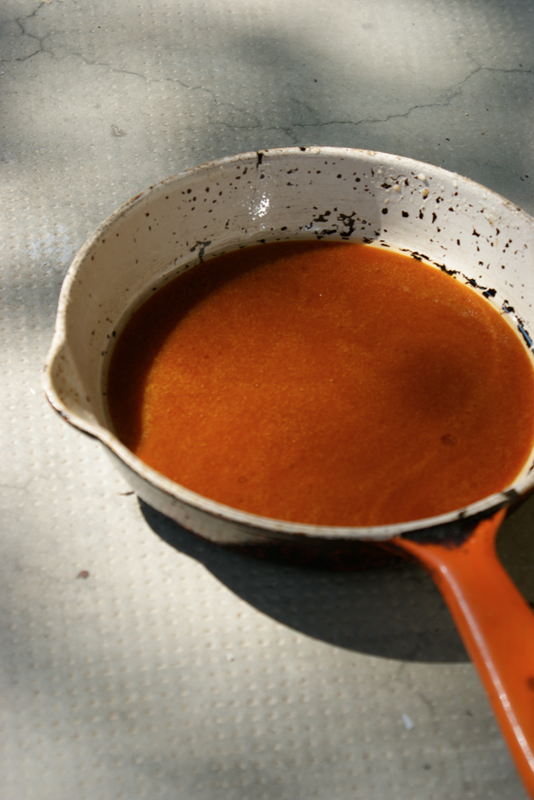 Having never used it before, I decided the easiest way to go about it would be to sprinkle a little of the salt over the caramel as it cooled (well, I thought I would do it as it cooled - I put it out on the balcony in the dapped sunshine to cool and by the time I had got back, it was solid...). I think this worked pretty well - the caramel was absolutely divine. I don't know if it would have been better to stir it in earlier but it must have melted and bubbled away in the oven. Perhaps another time I would be less hesitant about adding too much - I was worried I would ruin it. It turns out I'm not anywhere near as good as E. at arranging pear slices in a pretty pattern. It didn't help that the length of the pear slices exceeded the radius of my pan, so I ended up with a skewed flower pattern. 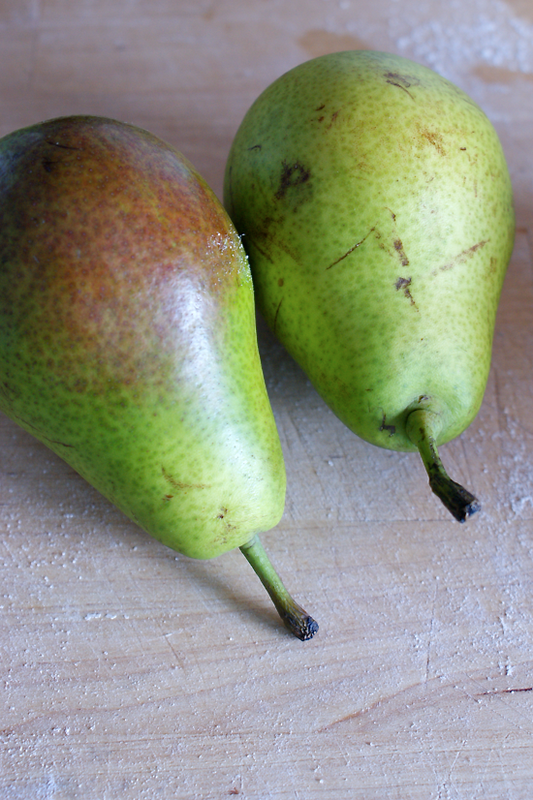 During my lengthy arranging process, the pears turned a little brown - as you can see above. Since they were just about to be drenched in golden caramel and sit bubbling away in it for half an hour, I figured it wasn't a tragedy. All I changed from the original was halving the recipe, using puff pastry and adding the fleur de sel. The addictive qualities and taste is all down to E.
I served mine with mascarpone (which was lovely) but I think vanilla ice cream would be devastatingly good. Creme fraiche or double cream would work too. Preheat the oven to 200C/390F. Roll out the puff pastry to a little bit bigger than the bottom of a roughly 16cm/6" skillet/pan - it doesn't need to be a perfect circle. Pop in the fridge on a plate to chill. Spread the sugar in an even layer over the bottom of the skillet. Place over a medium-high heat and watch carefully - after a few minutes, the sugar will start to liquify at the edges. Don't stir it - you can flick some of the crystals onto a liquid bit, but don't fiddle too much. Once it's nearly all melted and starts to caramelise, swirl it all together. Keep heating until you have a deep golden-bronze colour then take off the heat. Quickly add the cold butter and salt and stir until the bubbling stops. Leave to harden while you prepare the pears. 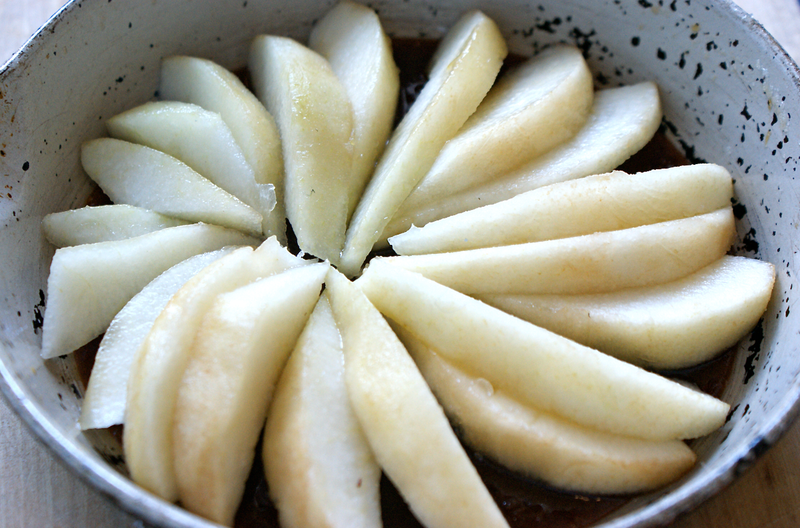 Peel and slice the pears (I sliced each quarter into 3-4 pieces) and arrange in a circular pattern on top of the caramel. Place the pastry over the top. 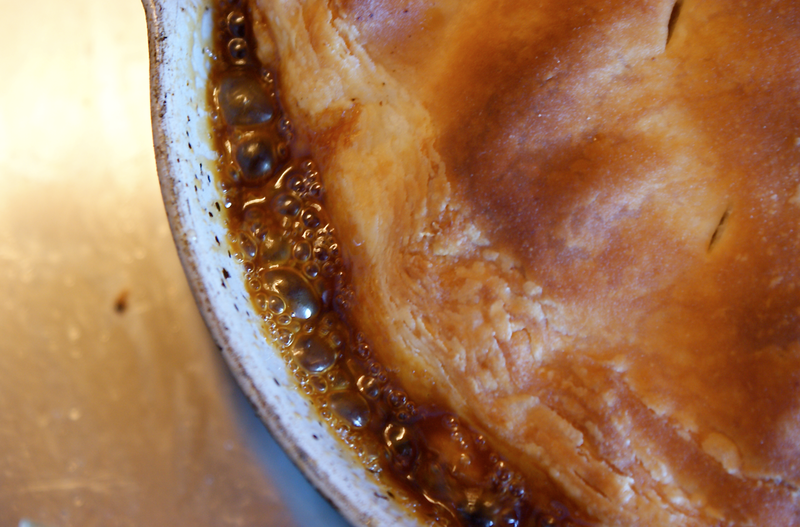 Bake for 30-40 minutes or until the pastry is golden and the caramel is bubbling around the edges. Remove from the oven and leave for 2-3 minutes before placing a plate on top and flipping over. Rearrange any pears that have moved and scrape any remaining caramel over the top. Serve warm with vanilla ice cream or creme fraiche. UPDATE 26/11/2017: rewritten to clarify and update techniques - I reduced the butter and salt amount and stirred in the salt with the cold butter at the end of making the caramel. I made this with unripe comice pears and they worked beautifully. I used homemade rough puff from this foundations post. 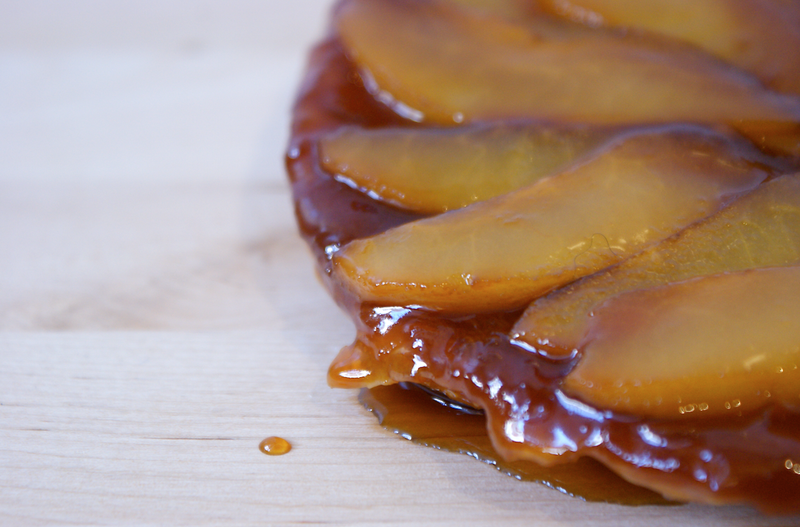 Salted caramel is the best and this pear tatin looks divine! This looks lovely. I really like any sort of tartin's but this looks especially yummy! I am so happy you enjoyed the tart. It looks gorgeous and I love salted caramel! This is my most favorite dessert - with vanilla ice cream, for sure! I love the salt idea as an addition. Maybe some melted chocolate drizzled over the top too. I have the same pot of Fleur de sal!! I bought mine from a same market in the South of France though?! I use it far too sparingly too, and I definitely need to try it with caramel.